Rainhart would have burst into Tancred&apos;s tent, but Philomena was ahead of him, and she stopped to wait for the guard to announce them. Agog with curiosity, Rainhart entered the tent and looked around. There was a woman sitting at the table looking down into a pewter cup. She darted a look at the tent flap, then returned her attention to her drink. Rainhart&apos;s first reaction was that Tancred had been factually correct: Rainhart would never have guessed who the visitor was. In fact, he still had no idea. 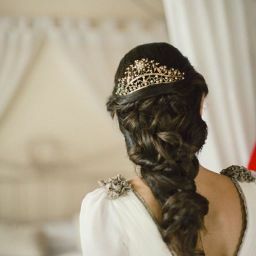 She was dishevelled, her hair falling out of its braids, her cheeks and nose red. But her muddy gown looked like it might have been brocade, and he could see a slipper peeping out from the hem. Well-born, then. Wait. He frowned. She did look familiar. "Princess Idella, you remember my cousins Princess Holle and Prince Rainhart?" said Tancred. 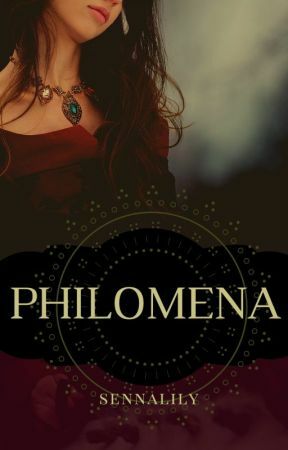 "And Lady Philomena, of course." Beside him, Holle made an audible noise of realisation and swept forward. "My dear Idella, I am so glad to see you," she said, reaching out her hands. "We were so worried for all the captives. Are they alive and well? Mother and my brother—your husband?" Idella made a breathy noise of distress. No wonder Rainhart hadn&apos;t recognised her; even as he watched she was making a visible effort to fade into the tent wall behind her. "The princess has been through an ordeal," said Tancred. "It is only by the grace of the great gods that she found her way to us. I&apos;ve got men riding down the column to get her father." He sat down adjacent to Idella. "Queen Agneja is alive," he said, "and so is Prince Maldwyn. The barons are at Traumwald—the Teuta confined to the dungeons. Valdon has not executed anybody since Breg." Tancred paused, raising his eyebrows. "The Queen and Maldwyn are not confined to the dungeons." Rainhart blinked. "Why not?" he said. "Well—yes, my dear?" Tancred stopped when Idella put her hand on his arm and leaned towards him. "I can tell them," she said, just loud enough for Rainhart to hear. "Of course, my apologies. My friends, perhaps you would like to sit down." Tancred beckoned them all forward to the table. Holle sat beside Tancred with Philomena opposite. Rainhart found himself facing Idella across the table. Her gaze was fixed on her hands. "Take your time," said Tancred. "I&apos;ve sent word that we will stay here another night." Idella nodded. She took a breath that raised her shoulders several inches, and pushed the air out. "My—Prince Maldwyn has set me aside," she said, looking up. For a moment her eyes locked with Rainhart&apos;s, and without meaning to he caught a flash of an image from her mind: Maldwyn shoving her through a castle barbican and laughing as she stumbled over. Time for you to leave, my sweet Idella. I&apos;ve no use for you. Struck with pity, Rainhart bit his lip. "He will have married Valdon of Traumwald&apos;s niece-heir by now." "He has thrown his lot in with the rebels," said Holle. Tancred reached out. "I am king, and I do not acknowledge the dissolution of your marriage," he said. "You will be treated with the honour and respect of a princess, and will always have a home in my castles, should you wish it." "Thank you," Idella whispered. Rainhart caught another flash of an image from her, which made him look up sharply. A guard leaned through the flap. "Your majesty, Lord Ilan of Lilienthal is here." Tancred nodded. "Show him in. Princess, you must wish for some rest and a fresh gown. You have my leave to go with your father. I will look forward to speaking with you more."